Have we reached an end to the era of peaceful third party intervention in conflict management and resolution? In the 1990s, with the ending of the Cold War, the intervention of third parties as a non-violent means of negotiating settlements of intra-state conflicts gained prominence but the emphasis in the twenty-first century has been increasingly on military responses. 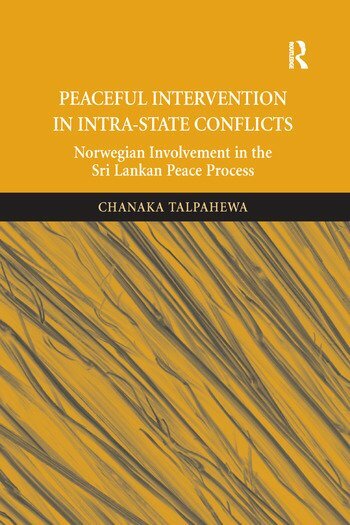 Peaceful Intervention in Intra-State Conflicts: Norwegian Involvement in the Sri Lankan Peace Process is an in-depth, impartial discussion on the background, decision making processes and procedures and related actions in the Norwegian facilitated peace process in Sri Lanka that gradually shifted towards a military solution. It provides the reader with evidence based comprehensive analysis on the attempts of peaceful third party intervention in a complex ethno-separatist intra-state conflict. ChanakaTalpahewa obtained his PhD and MPhil from the University of Cambridge, UK and was the recipient of the Cambridge Commonwealth Trust Scholarship, Developing World Education Fund Scholarship, Smuts Scholarship in Commonwealth Studies and British Chevening Scholarship. He has obtained his MBA, and MA (IR) and BSc from University of Colombo (Sri Lanka) and is also an Attorney-at-Law.